The Kickstarter Update for the month of May is upon us already and although brief it packs some explosive content. It consists of a new video entry in the "Developer Report" series (link to the full video at the end of the post), together with a short message. Will Shenmue III Be at E3? Let's take a look at the message first. It addresses the question that has been on everybody's minds: will there be a Shenmue III presence at E3 next month in June? Unfortunately, the answer to this question is a firm "no". "The current situation is that, in order to devote ourselves to development we will not be participating in any game shows in June." 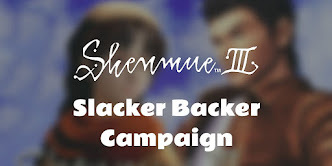 This news will come as a disappointment to many backers (including myself) whose hopes have been dashed of getting a fantastic Shenmue III trailer reveal at E3, an event which represents one of this year's prime opportunities to promote it on the world stage. On the other hand, just as was the case for the PSX event last year, it would be counter-productive and potentially damaging to Shenmue III's image to show material that Yu Suzuki does not feel comfortable with. Reading between the lines in the message, he may also have made this call to avoid having precious developer resources being sucked away from the project to work on a trailer at a critical time. However this does leave fans contemplating the implications for the current stated scheduled release date of December 2017, whose revision must surely be imminent. Moving on to the more uplifting part of the update: a video of just under 1 minute in length showing off a character model. A 2-D character design is displayed, no doubt from the pen of Shenmue character designer Kenji Miyawaki: a muscle-bound figure with long hair and wearing red suspenders and sweat bands on his wrists. The collar and fastenings on his top appear to be of a Chinese style. 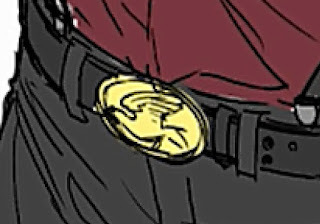 His gold buckle has an image of a flying bird-like creature on it - but is it merely a bird, or a deliberate phoenix reference? Character design: back, front, side. Gold belt buckle detail: a bird, or something more... mythological? 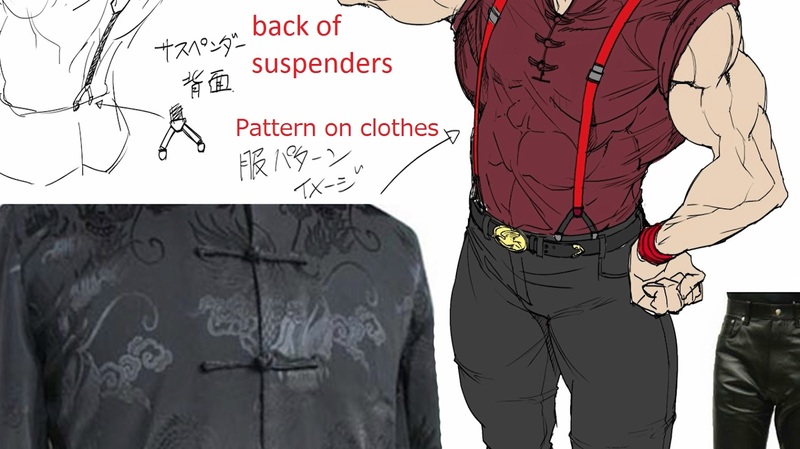 The artist has also included photos to illustrate the kind of patterning for the character's top, and the material for the trousers. I've translated the couple of hand-written notes, although nothing mysterious is contained in them. Suspender detail & clothes patterning. 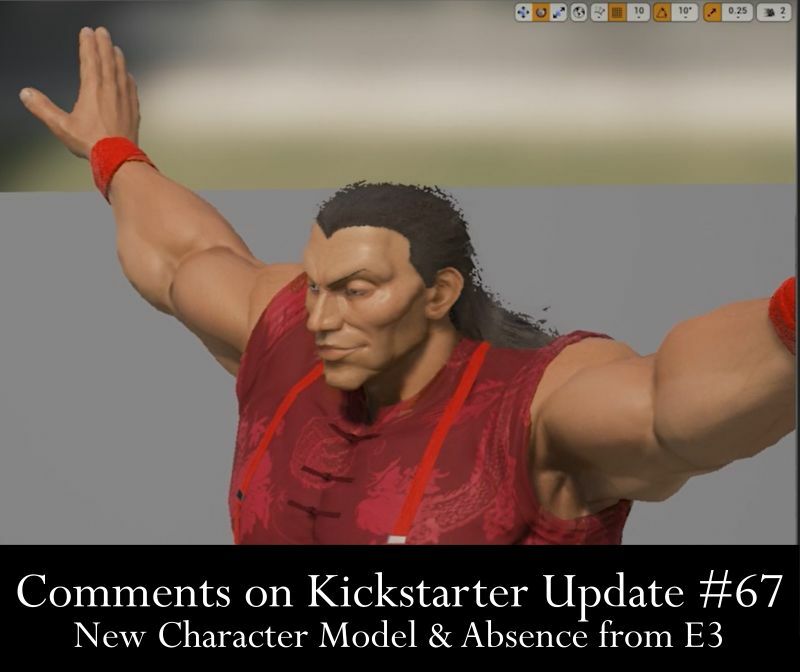 The resulting 3D model is amazingly faithful to the artist's original sketches, whereas with the original Shenmue games the gap between the sketches and in-game character models was much greater. 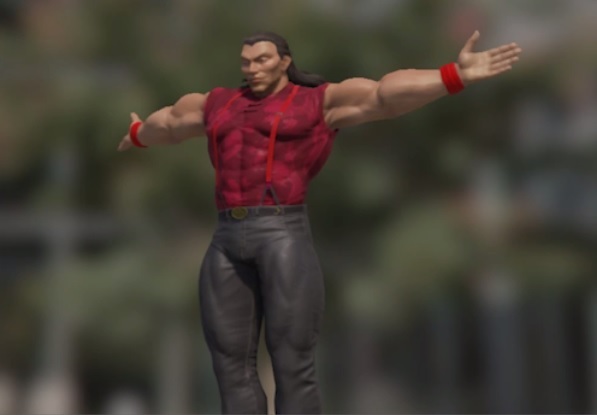 When the character moves, it can also be observed that the clothes and accessories he wears are modeled individually in 3D with their own physics. This is a big-step up thanks to the advances in technology, no longer needing to be "baked" into the textures as in the original games. 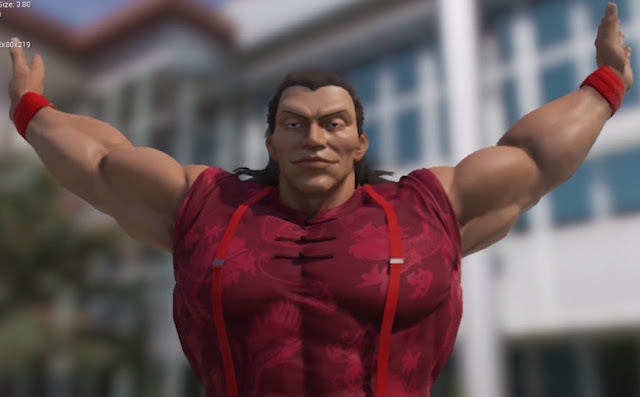 Although he has been created using quite different technology from the first two games, I am quite happy with the result and I don't think his appearance is one that will feel out-of-place in the Shenmue world. What's your take? 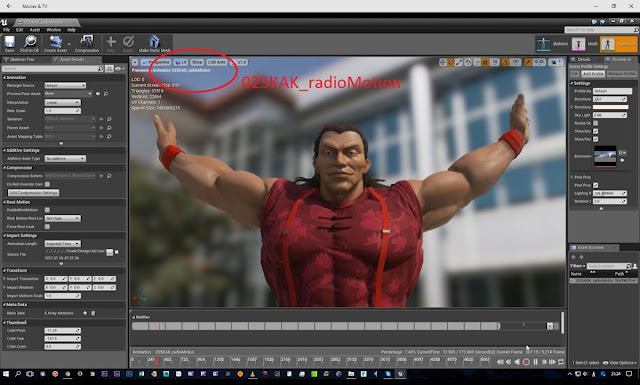 Aside: there were hardly any clues or text snippets to be found in the video this time, although from the Unreal Engine screen it appears that the character has been given a code of "025KAK". (Perhaps the 25th registered character in the Shenmue III universe...? Clutching at straws!). Unreal Engine: codename of the character? Watch the full update video below, hosted by the Shenmue Dojo. I was quite down on this update initially due to being bummed about Shenmue III not making an appearance at E3 this year. First and foremost, I am thankful they are not aiming for a photorealistic aesthetic for the character art direction of this game, which I have vented about on twitter in regards to the current trend Japanese developers are following these days. Shenmue has a very distinct look about it; love or hate it there is no denying how unique it is. Personally, I love how high res the textures are and yes even the baked-in details of the shadows, folds, and such being portrayed in the textures. This was a technical limiation for the time, yes, but it is also a form of artistic merit. This NPC (work-in-progress I know; not sure why they didn't add a label text description in the video as in the last update) retains an anime-esque appearance, but also just looks off since it gives off a plasticy appearance due to no details on the actual skin yet, which results in a a silly cartoony appearance (reminds me of Street Fighter a bit). I have faith things will improve with time and the art direction can be nailed accordingly. Must be quite a challenge for Yu Suzuki and his team to nail a unique aesthetic that cannot be replicated overtime like the prior games with all this modern technilogy (simply me making an assumption). I can continue to critique but no point thinking too far ahead. 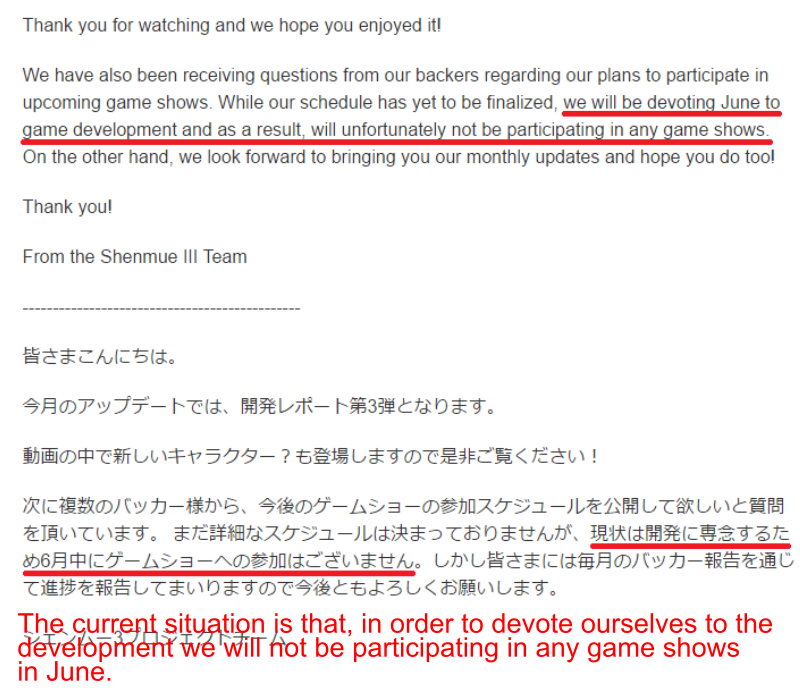 To digress from this post a bit here is hoping Shenmue HD can still make an appearance at E3. It would soften the blow quite a bit. I know what you mean about that "look" the characters in the first games had. But with a totally different development set-up compared to back then, I'm at peace with the fact that it's probably going to be impossible for look to be replicated exactly in the new game. Yes, Shenmue 1 & 2 HD being announced at E3 would be perfect timing to keep public interest high in the franchise. Quite a bit of people on the net seem put off by this 'early' character model. I must admit that plasticky look is a bit jarring, but I understand this team is in a damned if you do and damned if you don't phase. Either they do not show us something and people get upset or they do show us something (not complete) and people still get upset. No dissapointment here about E3. On the contrary, this shows commitment from Yu and the team to deliver top-quality content and focus to deliver on time. Work on this character is great. 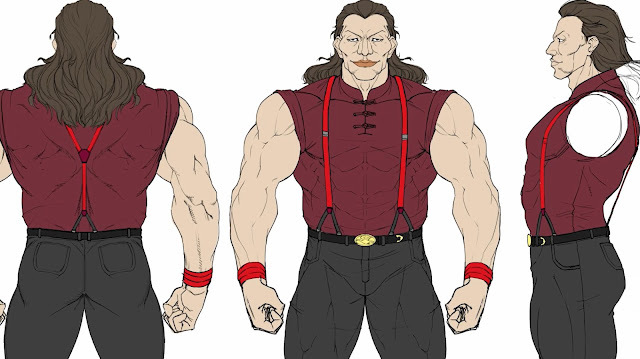 I'd truly like him to be a friend of Ryo, it would be a great asset added to his quest, speculating a bit perhaps he will be a foe due to the color-scheme on the pattern on his clothing and the bird design he perhaps works under Red Phoenix of the South herself, Chôjun. Nonetheless, speculation on my part. Thanks for the awesome work! Great theory! The belt design together with his color scheme could well point to him being one of her henchmen. I reckon that bird image on the buckle means that he's an underling to Niao Sun, since isn't she is the "Phoenix" of the four mythical beasts in the Chiyoumen? Could be wrong though! As you say, Niao Sun is associated with the Red Phoenix. I like your hypothesis and I'm guessing this may not be a coincidence! I'm honestly ok with this. I'd rather they keep working on the game over wasting time at E3. I think it's a rational decision if Yu knows that the release date will be slipping from December. 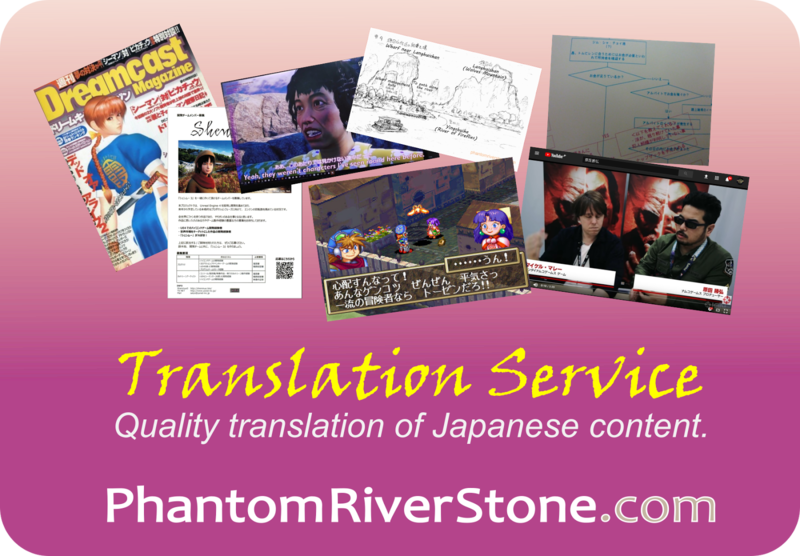 Hi, thanks again for the share and efforts for translation, always much appreciated! I won't make friends with that comment. Nonetheless, I'm still having faith for the game to be (at the very least) enjoyable at launch. However, what's been shown here leaves me the exact same impression than the time I saw Ryo's face at the very first trailer and I was like "OMG what are they trying to do with that". So, first of all, sorry for the rant, I don't know if it's a rant or not tbh, just trying to point out some things. See, I'm really that puzzled, haha. Artistically, it rocks. Some people can judge that, it's a matter of taste, but I like it. The character has a good appearance, charismatic even though we don't know about him yet. I always appreciate unique designs, and I sincerely believe that it'll be good for the future of Shenmue ; it does refresh the brand, definitely making its own design and it'll help to distinguish Shenmue from its "sons", Way of Samurai and Yakuza, and others "realistic" open-worlds. But in the details... holy macaroni! What is that animation? Who was in charge of this? The body acts like an inflatable toy! It lacks some serious body mechanics there... like muscles contraction, bone rig or muscle rig (or whatever this is called). I couldn't help but recalled myself that Shenmue is a fighting game based in martial arts, both action and scenario, philosophy... So, why don't they make emphasis on the "body" which is the central part of martial arts? Regardless of the graphic style, of course. Therefore, I have to put some links to recent games running on PS4 and previous gen. Hate me, but I can't help on this. It is (again!) as much undesired as this early Ryo's face, and as much unprofessional as letting viewers watch inanimate cows in a stunning beautiful trailer. Why am I showing the concurrent you tell me? 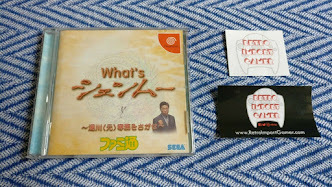 Because that's what Yu Suzuki did for Shenmue 1 ! He did get aware of what the concurrent was technically capable of. This is called strategy. He did well at that time. I know that these games are 100% dedicated to fighting. Shenmue is more than that, and I know this short video does not make proof for the final game. Just, I can't let things like that go and not pull the alarm bell! 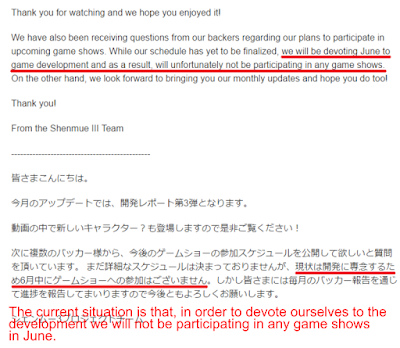 Shenmue 3 is likely to be released next year (at least), so changes will be made, I'm sure of that. Sorry for the (TL:DR) comment but it had to be said. I have my faith in Yu's work, but since the beginning I don't know who's working at the design and regardless of what's going on there, they're right about not showing anything during E3 because other ppl like me would have seen that errors and purely make fun of the game, while fans like me can just wait and wish for the best. Well said regarding judgement based on perceptions other people have. Thank you for sharing your thoughts about the update! As you say, we're being shown something that is "work-in-progress", and I think this model should make for a good base to work with and fine-tune for fights and battles etc going forward. Haha I had to come back and apologize for the reaction... I understand now that there always been a lack of communication in YsNet studios and that this character show up is likely an early-stage development. Of course, regarding other infos combined together, they are going to provide a much better game than what I see on these dev logs.